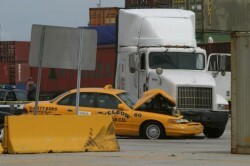 Traffic accidents are the leading cause of workplace fatalities. In fact, the Centers for Disease Control and Prevention (CDC) indicates that 35 percent of occupational fatalities result from auto accidents and affirms that car accident deaths are consistently the top cause of fatal work injuries. When a worker is killed or injured in a crash on the job, it is very important to get advice from an Atlanta workplace accident lawyer. Workers’ compensation claims and car accident claims have different rules, and the injured worker needs to understand how best to proceed with recovering the maximum amount of compensation available under the law. The Atlanta workers’ compensation attorneys at Parson & Associates, P.C., can assist those who have been involved in on-the-job car accidents understand their rights and make a claim for damages. Call us today to learn more about how we can help. Car accidents on the job are common in Georgia and across the country. These accidents cause tremendous losses. From 2003 to 2009, an average of 1,308 U.S. workers died each year in accidents on public highways. During the same time period, 316 workers each year died in crashes that occurred on industrial premises or in other off-highway areas. There were a total of 347 pedestrian workers killed in accidents each of those years by being struck by a motor vehicle. A fatal car accident on the job costs a business an estimated $500,000 in direct costs and liability costs. Each non-fatal car accident injury that occurs on the job has an estimated cost of $74,000. These costs include not just payment of medical bills to treat an employee injured in an on-the-job car accident, but also payment of other losses, including lost wages, disability benefits and death benefits. When is a Motor Vehicle Accident Covered Under Workers’ Compensation? With so many people injured as a result of car accidents while at work, it is important to understand exactly when an employer could be responsible for providing workers’ compensation benefits. Employers could be responsible for providing workers’ comp benefits to a professional driver who is injured while driving, regardless of whether the driver was negligent. For example, a bus company that employs a bus driver or a trucking company that employs a truck driver could be responsible for paying workers’ comp benefits if the professional driver got hurt while driving a work vehicle. Companies that employ delivery drivers could also be responsible for on-the-job car accidents. This includes not just professional delivery companies, but also restaurants such as those who hire a pizza delivery person. Employers could also be responsible for car accident injuries in other situations as well. For example, if an employer hires a traveling salesperson, then the employer could be responsible for paying workers’ compensation benefits if a crash occurs. Employers could also be responsible for paying workers’ comp benefits in almost any situation where the employee is in the car as a direct result of work-related tasks. This could be true even if an employer sends an employee out an on errand, such as a boss who sends an assistant out to pick up lunch or coffee or to run errands. The key question is whether the employee was in the car and driving because the employee had to drive to fulfill a work duty. An employee, however, is generally not covered when commuting to and from work. Employers are also usually not responsible for car accidents that occur when an employee detours on a personal errand. For example, if an employee sent on a company errand decides to stop at his house to feed his dog, he would most likely not be covered by workers’ compensation for a car accident while he was driving to his home. Finally, employers could be responsible for paying workers’ comp benefits to workers who are hit by cars while on foot. A construction worker or a toll both worker who is hit by a car on the job, for example, could be eligible for workers’ compensation benefits. To learn more about how we can assist you in your workers’ compensation claim or in other car accident or work injury cases, contact Parsons & Associates, P.C. Call us now at 770-422-9000, or fill out our online contact form. We return calls within 24 hours from our offices in Atlanta and Savannah, and we’ll give you the personal service you deserve.